Balance knowledge/training is essential for all ages and all levels and something that can be applied to every aspect of life. Bring more diversity and challenge to your group or personal training sessions with the balance training exercises from this course. A step-by-step course Specialist Course that provides a solid foundation on how to assess a client’s balance, along with new approaches to proprioceptive awareness with effective warm-ups. Over 100 static balance training drills and progressions designed to challenge individuals of all fitness levels are explained and demonstrated. This Speciality Certificate Credential is easy to follow and apply and gives you the tools from a new viewpoint that will prepare you to give clients the best service possible when it comes to enhancing balance. ✓ Provide an entry level understanding of balance training. ✓ Understand what is proprioception. ✓ Discover what controls balance. ✓ Learn the basics of proprioception training. ✓ Examine the benefits of barefoot training. ✓ Amplify knowledge of balance training tools. ✓ Learn how to make traditional balance exercises more progressive. ✓ Expand knowledge on how to make smart equipment and exercise choices. ✓ Enhance proprioceptive awareness with effective warm-ups. ✓ Learn how to build a more stable foundation for individual client development. ✓ Amplify knowledge of basic balance training guidelines. ✓ Gain knowledge of static balance progressions. ✓ Provide appropriate instructional cues for proper balance technique. 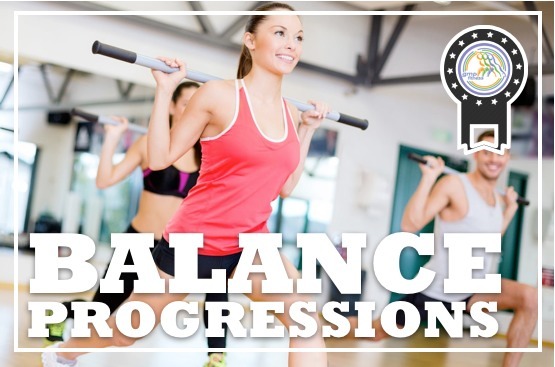 ✓ Learn Balance Progression training to help your clients condition their bodies to perform at their best. ✓ Understand how to design programs for stability.